All who love to fish need to be concerned about conserving our sustainable oceans and natural resources. Through experience a product was designed and developed by EcoLeeser, which is called the RokLees that returns Rockfish and other species back down to their habitat. With the RokLees our goal is to preserve fish that would otherwise float away on the surface and eventually die. Our inexpensive, conservation and easy to use product will help preserve and increase the stock of Rockfish for future generations to enjoy. Rockfish (Sebastes spp.) and other species of fish are unique in that they have a swim bladder, an internal buoyancy device that allows fish to adjust their depth. 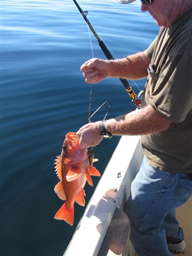 When fish are caught they are rapidly brought to the surface, which does not allow the fish adequate time to equalize. This causes rapid bladder expansion known as barotrauma (pressure shock). Fish suffering from extreme barotrauma have external symptoms like bulging eyes, pushed out esophagus and bloating. Typically, fish displaying these symptoms do not survive. Miraculously, many fish can recover from barotrauma if they are properly released to their respective depths as soon as possible. Without intervention, a fish with barotrauma may die from the progression of its wounds or succumb to temperature shock or predators. “Floaters�? – overly inflated fish that cannot re-descend on their own – are especially easy targets for sea gulls and sea lions. As a result EcoLeeser has developed RokLees that successfully releases rockfish back to the bottom. waterborne products and solutions for various applications.